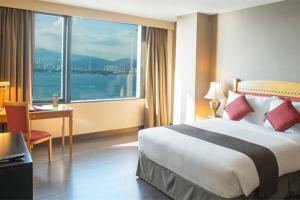 Best Western Plus Hotel Hong Kong is well located in Hong Kong's diverse Western District. The 100-year-old tram service stops in front of the hotel and MTR stations are just a short walk away. Rooms and suites on high floors feature awesome views of the Victoria Harbor. With a 24-hour front desk, concierge service, Wi-Fi, parking and a gym are available for your comfort and convenience. An all-day dining restaurant and an evening bar lounge offer a welcome respite after a day out exploring the city.